This riotous red marble sat in my studio for 3 years waiting for the right idea. I loved the stone on first sight, but knew the bold pattern created by billions of bits of fossilized shell demanded a simple design with strong, clean lines. The stone has been with me for almost all my years of carving. It is a pleasure for me to now see it as a stone sculpture. I had very little experience with foxes before moving to Colorado. I had seen a couple of Gray Fox in southern California, but only for brief moments before they vanished into the brush. Here, the Red Fox is a bold creature, trotting through backyards in mid-morning, a frequent visitor to walking paths and bike trails. One time while visiting my sister in Steamboat Springs I was walking on a bike path along a small creek. There were small islands in the creek, and on one of the islands was a fox taking a bath in the sun. I stood there for many minutes watching in plain sight of the bathing fox. No reaction. No big deal . . . for the fox. This calamitous Rosso Bilbao marble was a pleasure to carve. It is of medium hardness and with very few quirky properties–not chippy or overly brittle. Finishing was an adventure in discovery. Every 2 or 3 grades of sandpaper used produced a different shade of red and more detail in the shell inclusions. Sanding is a sort of Zen experience, akin to watching grass grow, but sanding Rosso Bilbao borders (almost) on entertainment. I waxed the stone at 600 grit. I chose this finish because the figure in the stone didn’t pop with a matte or satin finish. The stone is the star in this piece, and the strong silhouette of “Spiral Fox” can stand up to the shine and the pattern. A bold stone for a bold creature. 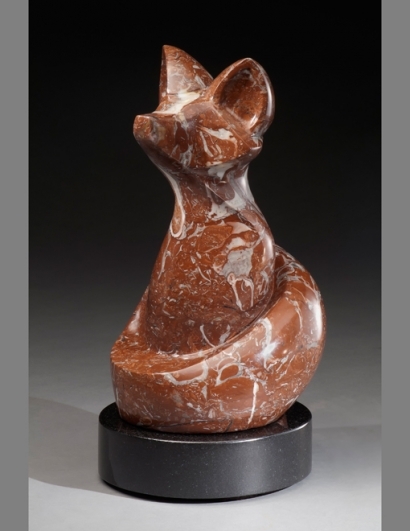 My first marble sculpture carved several years ago is called, “Spiral Bunny.” This fox is not meant as the antithesis or foil to that piece. Spiral Bunny is of substantial size and weight, and could easily intimidate this fox. There is an alternative balance to my personal world, and I prefer it that way. I love fox statues. They are so beautiful. Do you have any more. Thanks for your note. I occasionally make fox sculptures. I have made 2 so far and both are sold. (Spiral Fox and Vixen) I have an arctic fox scheduled to be made this summer. I will post it to my web site when it is finished. If you join my mailing list on the web site you will receive an email link to the blog post for the arctic fox. If you don’t want to join the list, you can always check back to my Available Sculpture Page to see the finished sculpture in July or August. Thanks very much for your interest in my work!